A Fracture can be very serious. It’s important to understand Fractures and understand what to do according to the severity of the injury. If there are any signs of a concussion, broken bones at the neck, head or back, deformed joints, no pulse, heavy bleeding, any abnormalities of the broken bone such as: a piercing of the skin or if the bone is irregularly fixed, call 911 immediately and perform CPR, if needed. 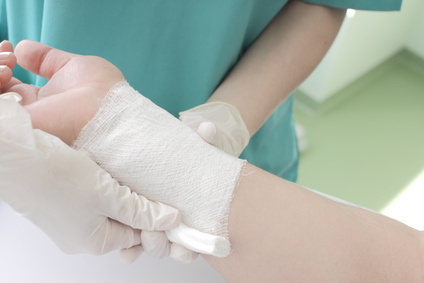 Treatment: Make sure to stop the bleeding by applying pressure to the Fracture and wrapping it if necessary. Apply a splint to the Fractured area. If the patient isn't moving do not try and move the patient yourself. If needed, apply a cold cloth or ice to the fracture. Remember, if the patient appears to be light-headed or on the verge of fainting lift the legs slightly higher than the victim’s heart to raise the blood pressure. Treatment: Make sure to elevate the injured area which will alleviate the pain. Also, apply an ice-pack or cold cloth. If needed, have the patient take a pain-reliever such as: Tylenol to reduce the pain and swelling. If the Bruise appeared on the head or if the bruise lasts longer than 2 weeks consider taking the patient to the hospital. Treatment: rest the Sprained/Strained area in a sling, crutch or flint. Make sure to place ice over the area to prevent swelling and limit application to 20 minutes unless the patient is irritated - limit 10 minutes. Make sure to apply a bandage to the joint or limb or use a brace, if possible. Make sure to raise the patient’s Sprained/Strained part 12 inches above the heart.